The Dorset Dirt will test all your off road skills. If you get it right you will arrive back at Top o'Town with four stamps on your card and a big smile on your face. It costs £10 to enter including free refreshments at Buckland Newton and bottled water at the controls. Enter at the registration table in or near the café at Dorchester Top o’Town Car Park and be ready to start at 10am. Free refreshments will be available at Buckland Newton village hall and bottled water will be available at all of the checkpoints. Half price entry for charity riders when you bring your sponsorship form when you enter. This is our contribution to your cause. 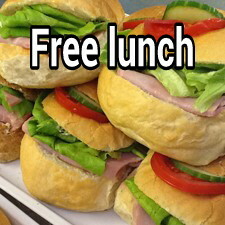 Charity riders also get free lunch. There may be a special start for charity riders at 10.15am with photo opportunities. Little has changed on the high chalk ridges and quiet, wild places of Dorset in the 30 plus years this classic has been run. The early autumn weather is perfect for the riders, headbangers and loiterers alike. 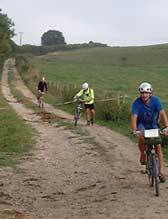 The first finishers usually show their extreme fitness and cycling skills by returning soon after lunch. Many others enjoy taking their time to appreciate and enjoy the quiet in the sunshine. You see an enormous variety of wild life from rabbits to deer and pigeons to buzzards. Starting from Dorchester it takes in countryside near to Piddlehinton and Cheselbourne. It then goes west towards the Dorset Gap and along the Wessex Ridgeway to Buckland Newton for lunch. You then climb Batcombe Hill and return to Dorchester along the high ridge of the chalk downs. We will provide you with a route card at the starting point and will validate it at check points along the way. This is a reliability ride. You will need to find your own way round. Latest updates are on Facebook. Many riders use GPS and/or a smart phone. We don't provide support for breakdowns. We will do our best to help if we can but please be prepared to be independent and for example pay for a taxi back if things go badly wrong. A beautiful cross country 50km (about 30 miles) off-road bike ride around central Dorset. Starting from Top O'Town car park, Dorchester, the route forms a loop that reaches out towards Ansty, cuts westwards through Buckland Newton and flirts around Cerne Abbas before dashing south towards the finish back in Dorchester. Phew! Come to the registration table in the café at Dorchester Top o’Town Car Park, sign on and be ready to start at 10am.. Sorted! Please use the link on the left to read our disclaimer before taking part.